With air fryer accessories, you are opening the new door to food. You are free to play and cook a variety of food. Imagining how happy it is to make a delicious meal with your family on weekend nights! 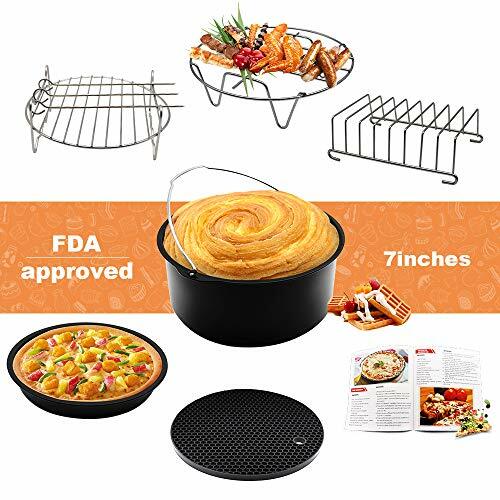 This cake bucket has a large capacity, you can use it to make delicious big cakes for the whole family! At the same time, it also comes with a handle for easy to remove from the fryer. Air fryer pizza pan have many uses. It can not only make pizza, but also make eggs, potatoes, pancakes and even giant biscuits. In a word, you can make a wide variety of foods according to your taste. First,cut the bread into pieces and place them neatly on the bread rack.Then,put it in a fryer and bake.Finally,wait for the arrival of delicious. It can expand your cooking space, allowing you to bake more food at once, saving your time and improving efficiency. It can be used with a fork pin. You can make delicious barbecues by stringing chicken wings, vegetables or other food on the forks! It has a high temperature resistant surface for thermal insulation. You can place a hot plate or pan on a silicone pad to avoid scalding your table. This cookbook contains a variety of ways to make food that can help you cook more food. 3.Do not wipe with metal products when cleaning. If you have any questions about this product by YooGui, contact us by completing and submitting the form below. If you are looking for a specif part number, please include it with your message.